Wes Ashlock was the first rider to the herd on Metallics Star in the John Deere Division Limited Open finals of the Lucas Oil NCHA Super Stakes Classic in Fort Worth Friday, and he laid down a winning 221-point run. Todd Gann took the reserve championship with a 218.5 on Hevvy Metal. The top two horses are both by Metallic Cat. Owned by John and Jana Thacker of Abilene, Texas, Metallics Star was a $17,500 purchase as a yearling at the 2012 Western Bloodstock NCHA Summer Sale. He was bred by GS Cutting Horses out of Swingin Star Lady, a mare that Dean Sanders rode to win the Non-Pro Augusta Futurity and Steamboat Springs Derby in 1999. That mare has also produced $200,000 earnerr Swingin Star Pepto. Metallics Star went over $50,000 in career earnings with his John Deere Division win. He has previous Limited Open championships with Ashlock at last year’s Abilene Spectacular and West Texas Derby. 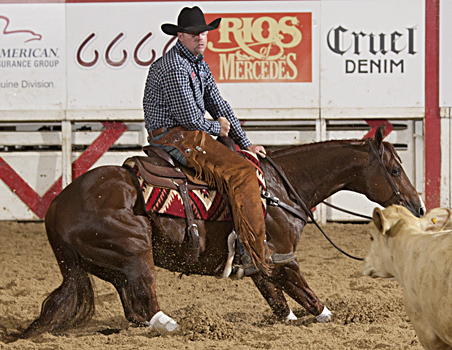 Ashlock rode another horse for the Thackers, Amafoxy Cat, when he won his first championship in Will Rogers Coliseum, the John Deere Division of the Super Stakes Classic in 2014.